Frozen shoulder is a condition that can come on spontaneously or with previous injury or surgery. This is most common in people between 40 and 60 years old. It occurs more frequently in women more than men. Factors that can contribute to developing a frozen shoulder are diabetes, thyroid conditions, Parkinson’s disease, or immobilization after surgery or an injury. Initially, there is a period of increasing pain and stiffness which tends to get better with time but can take up to 2-3 years to recover. During this period of time there are three stages including: the “Freezing Stage”, the “Frozen Stage”, and the “Thawing Stage”. The “Freezing Stage” lasts approximately 6 weeks to 9 months and is characterized by worsening pain and loss of shoulder motion. The “Frozen Stage” lasts approximately 4 to 6 months and pain typically improves but stiffness persists which can make daily use of the arm difficult. 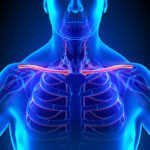 The “Thawing Stage” lasts approximately 6 months to 2 years, during which the shoulder range of motion improves to complete or near completely normal. This phase is not usually painful. Initial assessment will involve gentle movement in all directions to assess stiffness (active and passive range of motion) and pain. Frozen shoulder demonstrates limited range of motion in all directions. X-rays may be performed to rule out other causes for pain and stiffness. MRI imaging is not needed to diagnose frozen shoulder but could be ordered if other soft tissue injuries are suspected. The mainstay of treatment is non-surgical with a goal of controlling pain and restoring motion. Non-steroidal anti-inflammatory medications (ie. ibuprofen or naproxen) and steroid injections can be used to control pain. Physical therapy may be ordered but is not always needed. Surgical treatment with manipulation under anesthesia or shoulder arthroscopy can shorten the duration of symptoms.